The What: Chief debuted a new outdoor mount series designed to protect outdoor display investments and enhance the viewing experience at InfoComm 2016. The What Else: The new weatherproof ODM series features two durable solutions. The ODMLT Tilting Outdoor Wall Mount can hold 175 pounds (79.4kg) and features Centris technology for plus/minus 15 degrees of low-profile fingertip tilt to achieve optimal viewing angles; GlideLock with kickstand to secure the display to the wall plate without tools and for easy cable connection; and a padlock option for additional security. 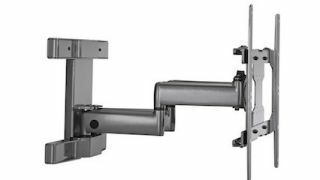 The ODMLA Articulating Outdoor Wall Mount has a 150-pound (68kg) weight capacity and more than 20-inch (508mm) extension range for optimal viewing from many positions; Centris technology, providing plus 5/minus 15 degrees of fingertip tilt; a Quick-connect interface for easy mounting; and a padlock option for additional security.